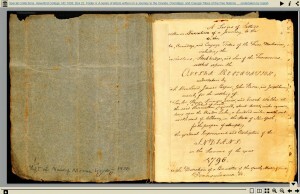 A series of bound letters from Joseph Sansom, describing a trip he took with several other members of the Philadelphia Yearly Meeting to the Oneida Reservation in New York State in 1796. 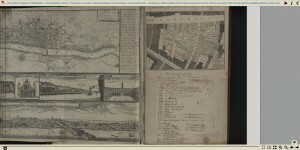 Click the image to view this journal in a page-turning viewer. 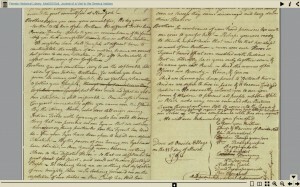 Journal of Joel Swayne, a Quaker missionary, to visit the Seneca in Western NY. 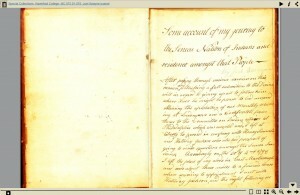 Account of David Bacon’s visit to the Six Nations in 1794 to attend the meetings that led to the signing of the Treaty of Canandaigua between the Six Nation chiefs and the government of the United States. 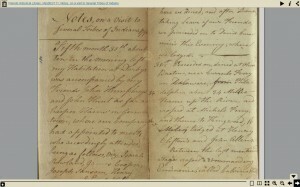 Account of the visit of Isaac Coates, Joshua Sharpless, and John Pierce to the Native American reservation on the Allegheny River in New York State. They travelled under the auspices of the Philadelphia Yearly Meeting, and were accompanied by Henry Simmons, Joel Swayne, and Halliday Jackson, who were to remain on the reservation. The travelers left Chester County on 1.5.1789. 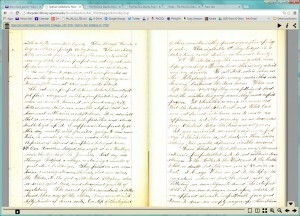 Click the image to view John Peirce’s notes on a visit to several tribes of Indians in a page-turning viewer. 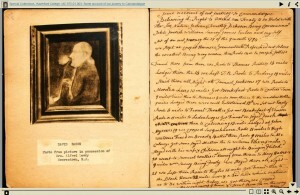 Journal of John Peirce, Quaker of Darby, Pennsylvania. 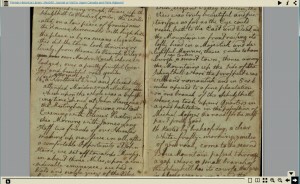 John Peirce documented his 61-day journey through Pennsylvania, New Jersey and New York in his journal titled “Notes, On a Visit to Several Tribes of Indians, 1796”. Peirce and his fellow Friends James Cooper, Joseph Sansom, Isaiah Rowland, Enoch Walker, and Henry Simmons left on May 30, 1796 for the Oneida reservation. Their goal was to meet with various Native American groups and establish agricultural programs. After passing through New Jersey and up the Hudson River to Schenectady, they followed the Mohawk River to the Stockbridge, Brotherton, Tuscarora and Oneida Villages. After meeting with the members of the various groups at the Oneida reservation, the party made their way further west to the Onondaga and Cayuga settlements. Their journey home took them through central New York and Pennsylvania through Bath and Painted Post, New York as well as Muncy, Catawissa, and Reading Pennsylvania. Peirce arrived home in Darby, Pennsylvania, on July 29, 1796.